What's an ableskiver, you say? They're delicious! (Do you really need to know more?) 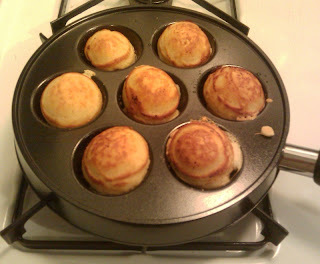 Ableskivers (or ebleskiver....or "puff pancake") are a Danish pancake, though not flat like the pancakes most of us know, but rather about the size and shape of a golf ball. The pans are traditionally cast iron or non-stick, and have seven deep indentations in them. While typically served with a Scandinavian treat like lingonberry jam, they can be made sweet or savory. I was first introduced to ableskivers by my friends in Denver over Easter weekend (you can see my previous post here), and when I was at the Williams Sonoma/Pottery Barn/Restoration Hardware store at the outlet mall recently, I picked up a pan and some mix. Then I started checking the internet for other recipes. And a few more months down the road, I thought, surely there must be a sourdough version. Surprisingly, there's not much out there! I only came across one sourdough ableskiver recipe, and with a few tweaks, here's mine. -- Combine the starter, half & half, egg, vanilla, sugar, & butter in a medium bowl. -- Combine the flour, powder, soda, salt in small bowl. -- Mix the dry ingredients into the wet, and gently incorporate it all. -- In a hot ableskiver pan, put a dot of butter in each well. -- Fill each well to almost the top of the pan. -- Once fully cooked on both sides, remove to a cooling rack. Can dust with powdered sugar or cinnamon sugar. *There are different methods to flipping them over, as well as how what to use. Some people like a chopstick or knitting needle; I found a small paring knife was easier than the chopstick. The original recipe from which I based mine from likes to rotate the balls 90 degrees, and then a final 90; I found they didn't really stay standing up at the first 90 degree turn (they look like Pac-man), so it was just easier to put the chocolate in, and slowly flip them a full 180 to finish cooking. Just see what works best for you! Mine had a nice slightly sour taste to them. One chocolate disk fills it perfectly, two might be good, but I didn't try it. Actually, I bet 1 1/2 would be perfect! Doing jam or pb takes a bit of quickness to get the filling in before overcooking them. Can't wait to make some savory ones, like with some herbed goat cheese & pork bits! Yeah! You made them-Now are you willing to pass on a bit of starter for a mutual ableskivers lover? My pan has been sitting here waiting to try the chocolate ones. I also thought maybe some ricotta and sundried tomatoes would make a good savory for a tapas party? love the post!